Thanks to Dr. Roopa Arora, Salmaniya Medical Complex (Kingdom of Bahrain) for contributing this case and Drs. Hillary Zalaznick, Myriad Genetics, Inc., Utah (USA) and Maria Martinez-Lage, Harvard Medical School, Boston, Massachusetts (USA) for editing the discussion. To contribute a Case of the Week, first make sure that we are currently accepting cases, then follow the guidelines on our main Case of the Week page. At PathAI (www.PathAI.com), we are building artificial intelligence technology for applications in pathology. in our research and development efforts. If you have a whole slide imaging system that you are interested in selling, please send an email to: scanner@pathai.com. (2) We have added a new feature to the Jobs page - Jobs by Region and Subspecialty. This is for the US only, which has 4 regions (Midwest, Northeast, South and West). You can now get totals of all jobs (all subspecialties) or a particular subspecialty by region by using the drop down menu. (3) Twice a year, PathologyOutlines.com donates 10% of our Amazon commission to a non-profit. For the second half of 2016, we contributed $642 to the Flint Child Health & Development Fund. You can buy Pathology, non Pathology related books or any other items by using our Amazon link. Besides purchasing from Amazon.com (using our links), you can donate specifically to this effort by clicking here. Thank you! A 23 year old man presented with persistent headache for one week associated with intermittent nausea and vomiting. Past medical history, family history, physical examination, neurological testing and blood work were unremarkable. MRI and CT scan revealed a well defined intra-axial cystic mass lesion with enhancing mural nodules,measuring 5.5 x 5.2 cm in the right parietotemporal region, surrounded by vasogenic edema exerting a mass effect on the ipsilateral right ventricle with a significant midline shift to the left side. No evidence of calcification or hemorrhage was noted. No other brain lesions were seen. No connection with the dura or ventricles was seen. Posterior fossa structures were unremarkable. A right frontoparietal craniotomy was performed and the tumor was excised. Gross examination revealed soft tissue fragments weighing 8 grams and measuring, in aggregate, 3 x 3 x 1 cm. Which of the following does NOT help distinguish anaplastic ependymoma from a WHO grade II ependymoma? Images 1 and 2 show a hypercellular neoplasm composed of atypical, hyperchromatic, spindle or polygonal cells forming perivascular pseudorosettes (tumor cells arranged radially around blood vessels with fibrillary processes extending towards the blood vessel). Confluent, serpentine zones of coagulation necrosis with nuclear pseudopalisading are present. 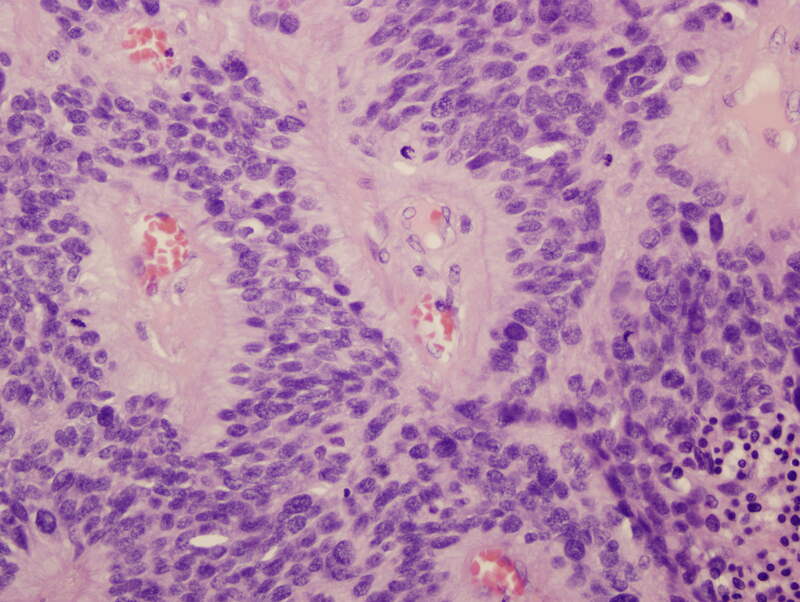 In some areas, markedly pleomorphic tumor cells are seen in a sheet-like proliferation with foci of microvascular proliferation and a high mitotic index (image 3). However, no true ependymal rosettes (columnar shaped cells around a central lumen) are present. 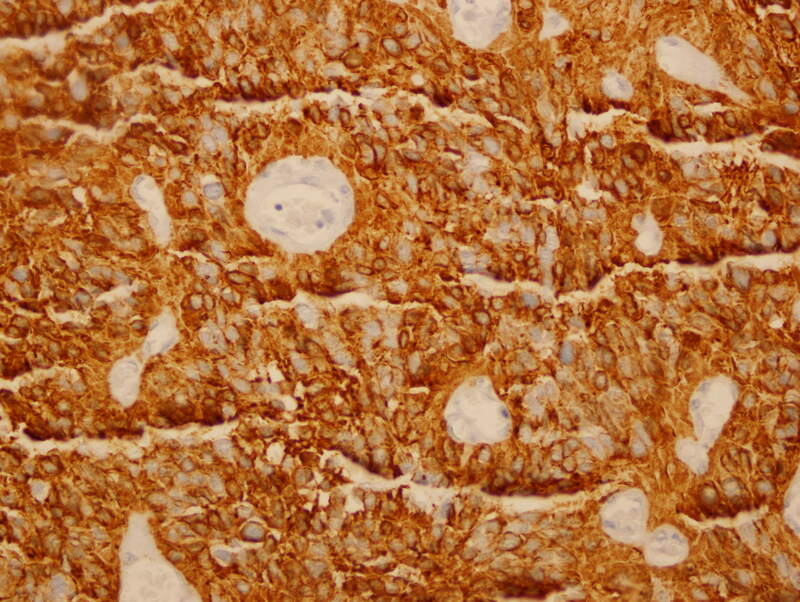 Immunohistochemistry shows positivity for GFAP (image 4) and vimentin; dot-like cytoplasmic immunoreactivity for EMA (image 5); and membranous and dot-like positivity for CD99. The MIB1 labeling index is 40% (image 6). 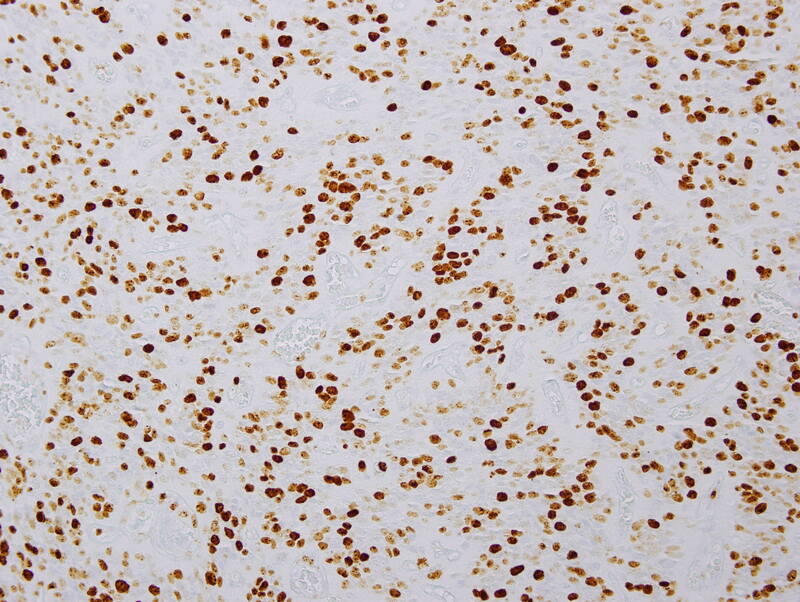 Stains for cytokeratin and neural markers were negative. 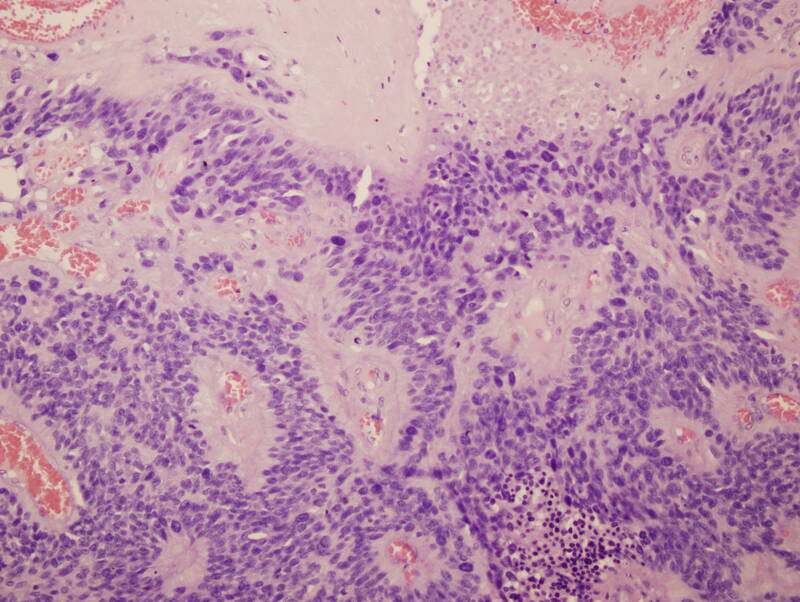 These findings are consistent with the diagnosis of anaplastic ependymoma. Ependymomas are typically WHO grade II; however, anaplastic ependymomas are considered WHO grade III. In contrast to WHO grade II ependymomas, anaplastic ependymomas show high nuclear to cytoplasmic rations and high mitotic activity, and they may also demonstrate microvascular proliferation and pseudopalisading necrosis. Non-palisading necrosis can be seen in WHO grade II ependymomas. Anaplastic ependymomas are associated with a more rapid growth and a potential for poorer outcome; however, the histologic grading of ependymomas and what role this grading plays in the prognosis has long been a contentious issue (WHO Classification of Tumours of the Central Nervous System, 2016). Compared to WHO grade II ependymomas, anaplastic ependymomas are more common in children and less common in the spinal cord (Wick: Silverberg's Principles and Practice of Surgical Pathology and Cytopathology, 5th ed, 2015). They tend to be circumscribed tumors but occasionally show frank invasion (WHO Classification of Tumours of the Central Nervous System, 2016). Although ependymomas typically originate in the walls of the ventricles or spinal canal, some cases have no connection to the ventricular system, similar to the current case (Childs Nerv Syst 2011;27:501, Neurol Med Chir (Tokyo) 2010;50:150, Neurol India 2012;60:131). "Ependymoma, RELA fusion positive" is a new entity described in the 2016 WHO classification of CNS tumors, defined by the presence of a genetic fusion event involving the RELA gene (WHO Classification of Tumours of the Central Nervous System, 2016). These tumors are exclusively supratentorial, accounting for approximately 70% of all childhood supratentorial tumors (and a lower proportion in the adult population), and portend a poor prognosis (Cancer Cell 2015;27:728). The fusion can be detected using interphase FISH with break-apart probes or with next generation sequencing techniques. 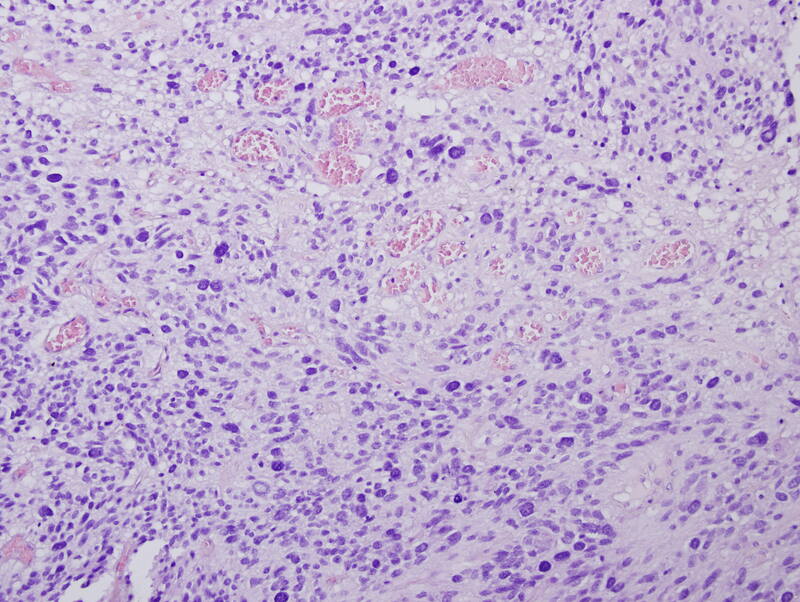 Anaplastic ependymoma may be difficult to distinguish from glioblastoma, which has a much poorer prognosis, due to atypia, microvascular proliferation, high mitotic index and pseudopalisading necrosis in both tumors (Neuropediatrics 1983;14:137, Acta Neurochir (Wien) 1983;69:243). It may also resemble medulloblastoma. Factors favoring the diagnosis of anaplastic ependymoma are true rosettes and perivascular pseudorosettes (which may be difficult to find) and tumor circumscription (Wick: Silverberg's Principles and Practice of Surgical Pathology and Cytopathology, 5th ed, 2015). GFAP and CD99 tend to be positive in ependymomas, and EMA is also positive in a significant percentage, either as cytoplasmic dots (more common) or along the luminal border of ependymal rosettes (“ring-like”). 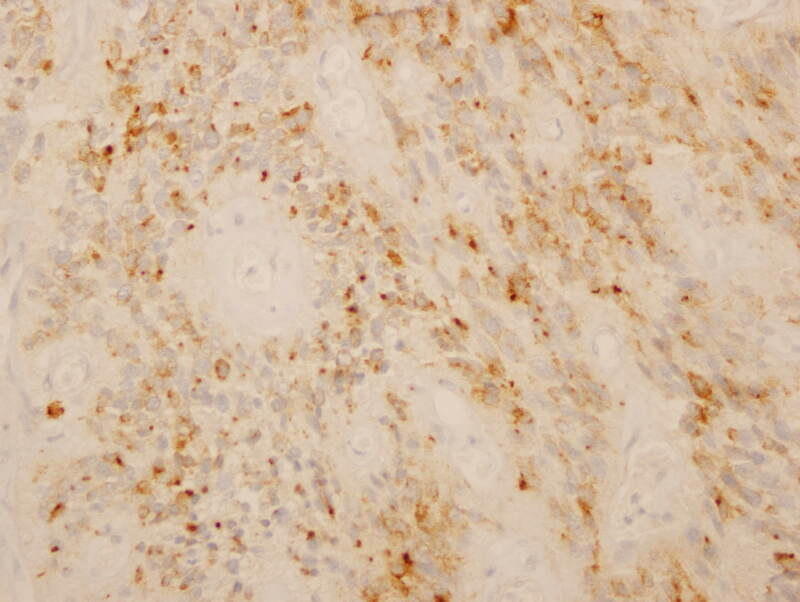 It is important to note that the EMA dot-like staining pattern can also be seen in glioblastoma, but the ring-like pattern may be more specific for ependymoma (Acta Neuropathol 2003;106:385). After subtotal resection, radiation therapy and chemotherapy are usually given, although the benefits from chemotherapy are unclear (Pediatr Blood Cancer 2016;63:547). The estimated 5 year survival for ependymoma/anaplastic ependymoma is 75% (American Cancer Society website), although the literature is limited. D. Unlike the other factors, areas of non-palisading necrosis can be seen in WHO grade II ependymomas.